Universeum, the science center in Gothenburg, Sweden, will focus on SDG 15 (“Life on Land”) on November 10th. Together with Chalmers University of Technology, Universeum will host a Science Café on biodiversity in rain forests. Martin Persson from the university’s Department of Energy and Environment will discuss his research on deforestation and other threats to the rain forests with the audience. How could the 15th Sustainable Development Goal help to save the forests? The South American rain forest exhibition at Universeum and its 25-meter high artificial tree will serve as a link to the Science Café talk. 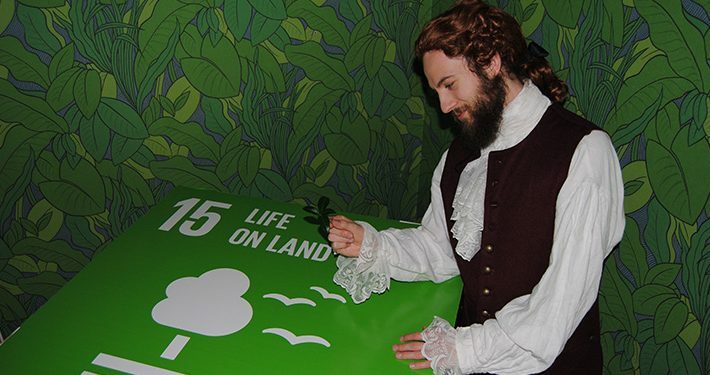 There will also be a historical science theater during the day where the famous Swedish 18th century botanist Carolus Linneaus will act in pop-up scenes at the exhibitions at Universeum and give “elevator speeches,” explaining the Linnean system of nature in 40 seconds. What would he have said about SDG 15 and today’s extinction of species? The aim of the theatre production is to arouse curiosity about natural sciences through historical story telling with a humorous twist. The theater is a cooperative effort among Chalmers University of Technology, University of Gothenburg, and Universeum. The screenwriting and acting is performed by members of the Chalmers student theatre group.